The Korean traditional attire of hanbok will be showcased at an international fine art event next month in Miami. At the opening art show of Art Miami, 12 models in hanbok dresses, designed by Lee Hye-soon of the hanbok brand Damyeon, will be walking among the 500 guests, giving them a close look at their elegant lines and fabrics and sophisticated colors and patterns. “I am invited to showcase hanbok at the opening art show titled ‘Fashion is Art.’ I am happy with the title because it’s the phrase that I have always kept in mind and have been using whenever I give lectures to students,” said Lee in an interview with The Korea Herald on Monday. Lee, president and designer of Damyeon, exemplifies keeping tradition alive in daily life by wearing hanbok as her normal attire for 20 years. Her endeavor to bring hanbok closer to the contemporary way of life has not been easy. She was banned by a hotel’s staff from entering a restaurant earlier this year for wearing the long hanbok dress. The staff in question claimed that the dress “gets in the way of other customers.” The incident caused fury among the public and the president of the hotel later apologized in person. Damyeon hanbok are characterized as showing “sophistication with traditional luxury,” represented in elegant colors, patterns and tailoring. Her designs offer comfort that most people don’t expect in hanbok. Her sophisticated reinterpretation of traditional hanbok caught the attention of the Miami-based art mogul Bernice Steinbaum, who is also director of Art Miami. “She told me that she lingered on the pages of my clothes while she was flipping through a picture book with different hanbok pieces. Somehow her style and my style just hit it off,” said Lee. The 12 pieces selected by Steinbaum happen to be the primary pieces that inspired Lee to produce other pieces and their variations. “The whole experience with Steinbaum has taught me not to lose the traditional edge in my hanbok designs, especially when I bring a contemporary appeal for everyday wear and wedding lines,” said Lee. 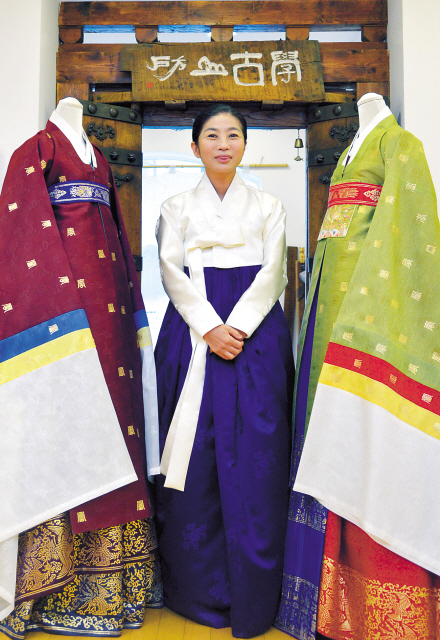 Balancing tradition and modernity, Lee said there is so much to study about hanbok and that many aspects of hanbok can be incorporated into modern living. “Hanbok can express a variety of characteristics ― the comfort, sophistication, luxury and avant-garde ― and all these came from the wisdom of our ancestors,” said Lee. Lee continues to study traditional Korean clothing culture and wedding ceremonies and hopes to add a contemporary vibe to them so that more people can wear hanbok in daily life. In line with the effort, she plans to launch a baby brand “Damyeon-ah” (“ah” meaning sprout) at the end of November. She also strives to mix hanbok design with modern clothes such as school and company uniforms so that more people will be comfortable with the hanbok design. “I always wear hanbok. And I get praises from many people including foreigners for its sophisticated feel mixed with the classics. And I will continue to keep its reputation and present the best hanbok to the world,” Lee said.